Geraldine Peak (a.k.a. Whirlpool Mountain) is a highly prominent mountain in Jasper National Park that's bounded by broad valleys on all sides, and not only offers exceptional views for long distances in every direction, but also a great diversity of views. Aside from providing an excellent vantage point to survey nearby Mt. Fryatt and Mt. 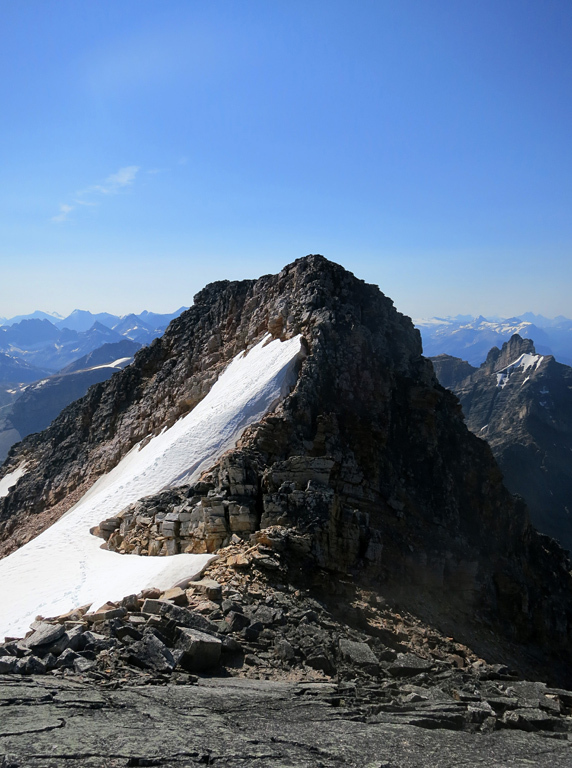 Edith Cavell, two of Jasper's tallest mountains, travellers here will also be treated to Geraldine's many emerald lakes and the dramatic, razor-like peaks which dominate the landscape between Verdant Pass and the Tonquin Valley, and also between Mt. Fryatt and the distant Mt. Clemenceau, which is visible from 50km away. Of course, these views come at a cost. Although the hands-on scrambling required to reach Geraldine's 2,947m summit is moderately difficult at worst, and only briefly, the hiking which encompasses the rest of the journey is easily the most difficult I've ever done. By the time Eric Coulthard and I had made it back to the trailhead, 12 hours later, the 18km round-trip had cost me my ice axe and had damaged both of my trekking poles. However, the day had been worth it. This journey begins from the end of the Geraldine Fire Road, which can be reached from the Icefields Parkway by following the turnoff to Athabasca Falls, 30km south of the Town of Jasper. Aside from some muddy patches near the Fryatt Valley trailhead and some sizable potholes, the fire road should be navigable by any vehicle with a decent amount of ground clearance (for instance, a Toyota Corolla made it to the trailhead this day). Be sure to enjoy the first few hundred metres of the Geraldine Lakes Trail because, aside from a few very small patches, this will be the only stretch of “clean” trail you're going to experience on this trip. I eventually came to the realization that this is where nature beta tests its hiking challenges. Expect everything except punishing steepness: muddy sections, log-hopping, large tangled roots, windfall, avalanche damage, stream crossings, plenty of side-hilling, an absolutely epic amount of rock-hopping (seriously, I'm still rock-hopping in my dreams), incredibly loose rock, shrub-walking, and both bush and spider-whacking; on a constant basis, and often in combination. Even the summit ridge has some broken glass on it and, yes, new terms needed to be invented to describe some the challenges one encounters here. It was mentally exhausting having to consciously calculate foot placements, hour after hour, in relentless fashion. This is where the NFL should send its players to work on their agility. Digressions aside, once you've followed the trail to First Geraldine Lake and then contoured around its northwestern flank, you'll encounter the first boulder field of the day that's fairly short and well-marked with cairns and yellow diamonds. You'll soon find yourself back on the trail, passing a series of small waterfalls as you climb towards a plateau between the first and second lakes. Once on the plateau, you'll encounter the second large boulder field of the day. Cross to the right (southeast) side of this field near a large pile of fallen trees and continue westward. This boulder field is not as well marked as the previous one, but you should have little difficulty finding where the trail resumes to the climber's left of the pond at the southwest end. A little while later you'll encounter some avalanche damage that will force you to detour off of the trail. It can be difficult to see, but the trail resumes to the right side of meadow once you've navigated through the debris and soon leads to a nice lookout for the large waterfall at the head of the valley. As you near this waterfall the trail begins to climb steeply to the left, where you'll want to traverse to the right when that path forks after gaining about 60-80m in elevation; this will lead you to Second Geraldine Lake. There are a number of route options at this point, each with its own downside. Our goal was to ascend via the gently sloped southwest ridge of Geraldine and it can be reached by navigating around either side of Second Lake. If you continue along the trail around the left, you could face some fairly intense bushwalking from the southwest end of the lake to the ridge. If you head to the right, you'll need to cross the stream (which required some fancy rock-hopping — the best spots are closer to the waterfall) and then routefind your way to the ridge with a lot of rock-hopping and side-hilling on loose debris. We chose the latter and, if you look at the map, you can see that we followed a mostly diagonal route (the northerly line is our ascent route, and the southerly our descent route) to save some time, distance, and avoid having to bushwhack. Some scrambling was required just before topping out on the ridge, but it was fairly easy. Note: It may be possible, if not preferable, to take a more direct route up the mountain from around the northeast end of Second Lake. I can't comment on how difficult such a route would become nearer to the top, as some of the gullies were snow filled, but if feasible, it would save a considerable amount of time. However, at the same time, the best views of Fryatt and its tarns, Geraldine's sub-peaks, and Geraldine's Upper Lakes all come from the southwest end of Geraldine Peak, which you would completely bypass. The climb to the false summit up the ridge is a combination of boulder-hopping and slab climbing which, thanks to being covered in a kind of black lichen, was surprisingly grippy. If you're not concerned about looking cool, running up these slabs like a primate (on all fours) will allow you to gain elevation very quickly. 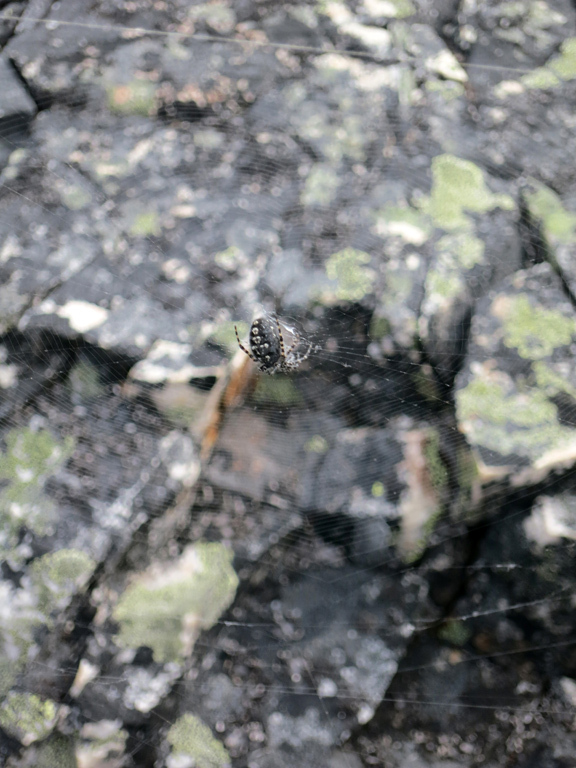 Keep an eye out for the incredible amount of spider webs while boulder-hopping here; there are literally hundreds of dime-sized black spiders at work on this ridge, and a trekking pole becomes an invaluable spider-whacking tool for this section. Once you're past the first false summit you'll quickly discover that there are several more to traverse as the summit ridge is quite notchy. The climbing and downclimbing is quite easy for the first few, at which point you should finally begin to see the actual summit a few bumps away. Soon thereafter you'll encounter the crux, which is a moderately difficult downclimb with a significant exposure to the climber's left (northwest). 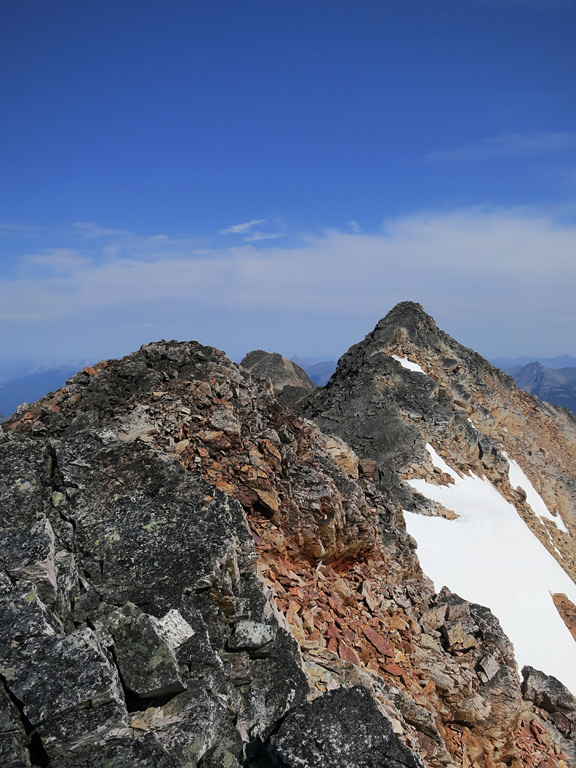 The rock and holds here were pretty good, and we were able to detour onto a firm snowfield that saved us from having to follow a narrow, rocky spine all the way to the bottom of the notch. I was curious as to why the top of the alpine route (the next highpoint at the northeast end of the ridge) has a much larger cairn than the actual summit, and we soon found the reason why; the very top of the actual summit is a loose rock pile where every step triggers movement, which isn't exactly conducive to lasting cairn construction. We also discovered that neither peak had a register, which was disappointing. It would have been interesting to know how often Geraldine's climbed. For the descent, we retraced the route along the ridge and then took a more direct route down the centre of the southwest face of Geraldine from the first false summit. If travelling in a group you'll want to spread out and descend in parallel paths as, after a certain point, almost every step we took unleashed a cavalcade of material down the mountain. You also need to be careful on the slabs here. Unlike the ones higher up on the mountain, these slabs are lichen free and quite slick, even when dry. After losing most of the elevation to the valley bellow, we begin to traverse over the boulders to the southwest ridge on a slightly upward trajectory. Unfortunately this route brought us to a part of the southwest ridge that's heavily vegetated all the way down to the lake. We probably could have re-ascended the ridge a bit to a cleaner descent route, and it's also possible we could have found a better route by descending further along the ridge to the southwest. However, we were tired and just wanted to get on with it; so we began to bushwhack and shrub-walk our way, diagonally down the mountain towards Second Geraldine Lake. I suppose I should define shrub-walking. The shrubbery was so dense on this slope that we were often walking purely on branches, usually a foot or two off of the ground. Unfortunately, the shrubbery was also so dense that it managed to pry my ice axe off of my pack, after which it fell into one of the few possible environments where it could do so without making a calamitous amount of noise. I didn't realize it had happened until I had circled back around the lake, executed a rock-hop over the stream worthy of a Bourne film, and retraced our route most of the way down to First Geraldine Lake. Even with the GPS route, finding my BD Raven Ice Axe Pro in that vegetation would likely be a futile exercise. It will probably still be there 100 years from now. Anyway, after that slightly souring realization, we hiked the rest of the way out to the trailhead before driving back to Jasper for some well deserved A&W recovery floats. You can continue traversing east beyond the true summit to another high point with a large cairn (which marks the top of the alpine approach route). However, some of the downclimbing required to complete this traverse is apparently quite difficult according to Eric, “a climber's scramble”, and should be approached cautiously. Be sure to bring plenty of water with you for this trip. Both Eric and I drank well over 4 litres of water during this trip, and would have consumed even more if water sources hadn't been so scarce beyond the second lake. 2,947 m / 9,669 ft.
1,498 m / 4,915 ft.
1,449 m / 4,754 ft.
710 m / 2,329 ft.